PHOTO: FIFA President Infantino, CAF President Ahmad and NFF chieftains at the inaugural edition of NFF-AITEO Football Awards in Lagos in February 2018. The second edition of the NFF-AITEO Football Awards, which inaugural edition held on 19th February 2018 at the Grand Ballroom of the Eko Hotel and Suites, Victoria Island in Lagos, has now been scheduled for 1st April 2019 at the same venue. President of the Nigeria Football Federation, Mr. Amaju Melvin Pinnick confirmed on Thursday that this year’s edition would be an even bigger occasion as the NFF and award sponsors AITEO (incidentally also the sponsors of the annual CAF African Football Awards) have perfected arrangements to expand the guest-list, guarantee greater radiance and panache and honour more legends of the Nigeria game on the night. Thenff.com learnt from other sources that CAF President Ahmad, FIFA Secretary General Fatma Samoura, members of the CAF Emergency Committee, an array of prominent political heavyweights and galvanizers in Nigeria, oaks of Corporate Nigeria, renowned administrators past and present, football legends and today’s superstars, foremost figures in the entertainment industry and media owners and chieftains would be among the invitees to the big event. 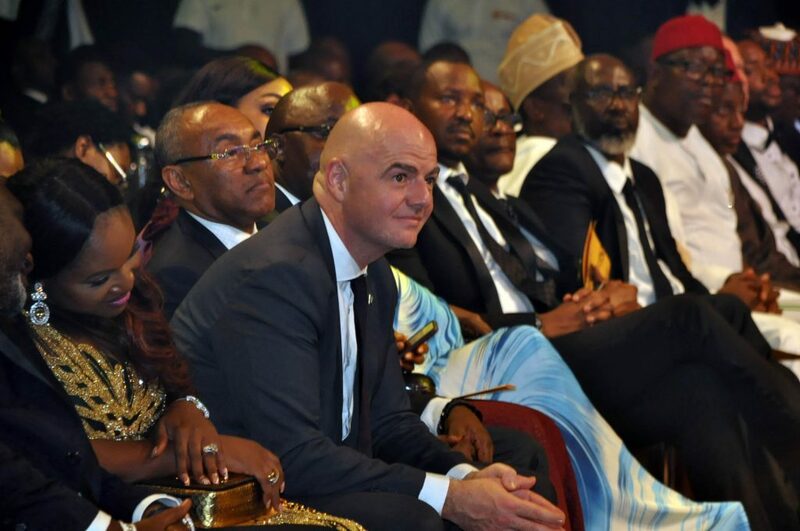 Last year’s inaugural edition wowed the football world with huge entertainment, with Governors Akinwunmi Ambode and Ifeanyi Okowa of Lagos and Delta States respectively, joining FIFA President Gianni Infantino, CAF President Ahmad, FIFA General Secretary Fatma Samoura, several prominent political figures, football legends and stars of today, giants of entertainment and media owners at the Eko Hotel and Suites for the occasion. It also marked the first time that the nation’s football –governing body was organizing an Awards ceremony to reward and inspire the major actors and actresses in the Nigerian Football space. Gongs were presented to winners in Player of the Year (men), Player of the Year (women), Coach of the Year (men), Coach of the Year (women), Young Player of the Year (men), Young Player of the Year (women), Team of the Season, Fairplay Award, Goal of the Season, Fans of the Season, NFF Development Award and Platinum Award categories. Also, there was a special recognition of a ‘Legends Eleven,’ a squad of outstanding former Nigeria international players. Recognition was also accorded the first Nigerian football team to achieve glory – the Green Eagles squad that won the football gold at the 2nd All-Africa Games that Nigeria hosted in 1973. AITEO’s Deputy Managing Director Francis Peters, said at the occasion: “The amazing power of football to heal wounds, enrich the gifted and entertain the majority is the reason why AITEO, Africa’s leading energy solution company, is investing in the game. We remain grateful to the Nigeria Football Federation for giving us the opportunity to begin charity at home. We also praise the leadership of the Confederation of African Football for providing us with the platform to be part of the continental terrain.